I have just finished watching one of the most important films I have ever seen. 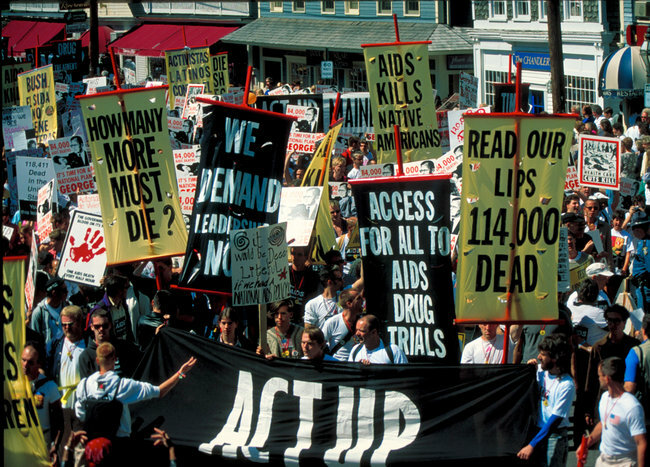 ‘How To Survive a Plague‘ focuses on the organisation Act Up, who during the 80’s and 90’s were directly responsible for the growth of political and public awareness in relation to the Aids virus. During the height of the groups activism, its leaders, affiliates and supporters, many of whom faced almost certain death from being HIV positive, focused on standing up to a government who seemed to have no intention of helping a community plagued by a killer disease. Through their triumphant and courageous efforts the medical and political community of the time were unable to simply stand by and watch people die of a disease that could indeed be prevented. The documentary shows the lives, and deaths, of those directly involved in Act Up and the incredible results that came about thanks to a movement who never gave up. This film is unbelievably powerful. Shot using a blend of video footage from the time and interviews, it puts you directly in the middle of the activism and emotional hiatus, and allows the story to be told from the people who were there, a film that feels utterly unique in its approach. It moved me to see people who in their dying days still took a stand and fought for what they believed in. They fought for their lives, for the lives of their friends and the lives of people yet to be born. They fought against a government and certain institutions who seemed to ignore the rising death toll and instead place blame on a community for the situation they found themselves in. They fought for humanity and life itself. Watch the trailer and then watch the film. This is a story that is long overdue, a part of our history and our present. Don’t ignore it.